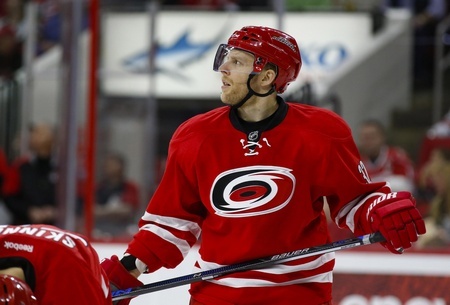 The Carolina Hurricanes have traded forward Kris Versteeg to the Los Angeles Kings in exchange for Valentin Zykov and a conditional fifth round draft pick. This is the second trade for the Hurricanes on a busy Sunday, with the movement of Eric Staal to the New York Rangers taking place earlier in the day. Versteeg will be an unrestricted free agent at the end of the season. The 29-year-old from Lethbridge has considerable playoff experience, with Stanley Cup wins in 2009-2010 and 2014-2015 as a member of the Chicago Blackhawks. Versteeg comes with a salary cap of $4.4 million, with $2.2 million of it retained by the Florida Panthers. This trade is about piling up experience, with Versteeg having 84 games worth of post-season play thus far. He has 42 points in the playoffs, including 16 goals, and will definitely find a spot as a depth player for the Kings before moving on. And if any player has made a career out of being a rental, it’s Versteeg. He has 33 points in 63 games this season and has spent time with the Hurricanes, Blackhawks, Florida Panthers, Philadelphia Flyers, and Toronto Maple Leafs. He was drafted by the Boston Bruins in the 2004 NHL Entry Draft, going 134th overall. The Kings have also been looking for help because of the injury to Marian Gaborik, which suggests Versteeg could slip in with Anze Kopitar and Milan Lucic up top. That would shovel Dustin Brown to the third line. He brings considerable offensive instincts to the game, even if he’s been a little cold as of late, and he can be a shifty player when the situation calls for it. And his coverage without the puck is responsible, making him a valid investment in most game situations. The knock on him is still his size, with his inability to win puck battles in the corner still an issue. The 20-year-old Zykov is from St. Petersburg and was skating for the Ontario Reign in the AHL. He was selected 37th overall by the Kings in the 2013 NHL Entry Draft, even after the NHL’s Central Scouting Bureau tapped him as a potential first round selection.